A deep red fleur de lis was fused onto a white glass to make a 6" square tile. 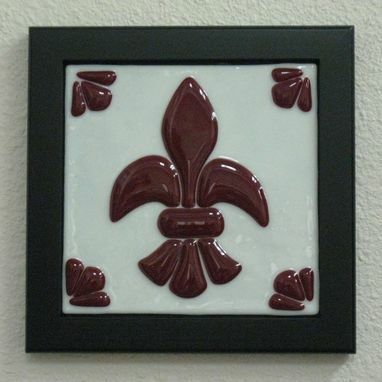 The tile was then glued into a wooden trivet which can be hung on a wall or used as a trivet. The piece has been sold ($40), but custom orders are available. Price will vary depending on design and size. Contact me for further information.